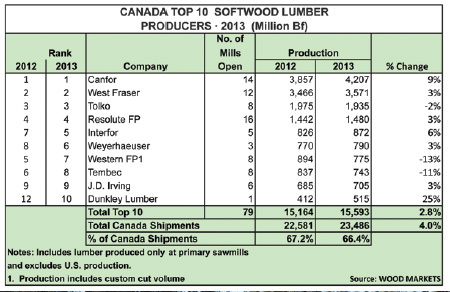 International WOOD MARKETS Group’s annual survey of Canada’s top lumber producers highlights rising production and a number of significant mill transactions in 2013. There is persuasive evidence that producers are taking the necessary steps now to ready themselves for further increases in lumber demand within North America and China. Although lumber shipments by North American mills to the U.S. and Canada grew, exports to China were also a big part of the story. Canadian producers (almost all from B.C.) 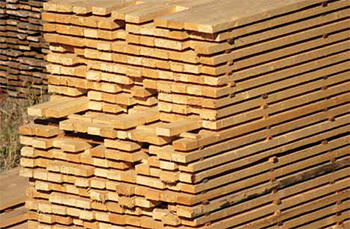 expanded their Chinese softwood lumber shipments by five per cent to 8.0 million cubic metres (3.4 billion board feet net to as much as 5.0 billion board feet nominal). Canada’s exports to China comprised 14.5 per cent of total shipments, a far cry from less than one per cent in 2007. Clearly, Chinese importers have become an influential force, impacting North American supply/demand balances for #3 dimension lumber, economy and, increasingly, #2&btr grades. In 2013, for the fourth consecutive year, total North American softwood lumber shipments rose—by 4.6 per cent, to 53.5 billion board feet, from 51.1 billion board feet in 2012. The U.S. led the gain, up by 1.4 billion board feet to 30.0 billion board feet (+4.9 per cent), with the increase spread evenly between the U.S. South and West. In Canada, shipments were up by a more modest 905 million board feet to 23.5 billion board feet (+4.0 per cent), led by increases from Quebec, Alberta and Ontario. Shipments from B.C. were up by less than one per cent as Interior producers continue to realign their operations to match the reduced availability of sawable timber (as a result of the mountain pine beetle epidemic that will eventually kill almost 60 per cent of the pine trees in the B.C. Interior). Some of the new B.C. Interior sawmilling dynamics and economics involve strategies on longer term timber supplies. For example, in 2013 Canfor announced the permanent closure of its Quesnel sawmill and West Fraser of its Houston sawmill (scheduled for late Q2/14). In recognition that there was not enough sawable or economic timber for both companies to operate a sawmill in each town, they both agreed to shutter a sawmill each and exchange timber tenures to better support the long-term viability of each company’s remaining mill. 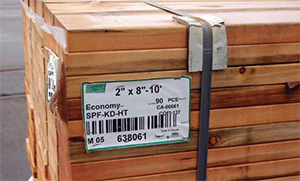 In 2013, softwood lumber shipments by the top 10 Canadian lumber producers grew slower than shipments for all Canadian mills (+2.8 per cent versus +4.0 per cent) This is because Canada’s largest lumber companies are located in the West and the vast areas of dead timber killed by the mountain pine beetle are limiting the amount of lumber that can be processed at sawmills. With many of the smaller companies located outside of the B.C. Interior, output grew slightly faster at these mills as compared to B.C. Interior mills. The top 10 Canadian lumber producers expanded their output from 15.2 billion board feet in 2012 to 15.6 billion board feet in 2013. Slower production growth than the national average resulted in the top 10 companies recording a small decline in their share of total Canadian production (to 66.4 per cent, versus 67.2 per cent in 2012). Of the top 10 Canadian firms, seven were based in Western Canada and accounted for 12.7 billion board feet and 81.2 per cent of Canada’s production by the top 10 (higher than from 2012, when the West accounted for 12.2 billion board feet and 80.5 per cent of the top 10 production). So, the bigger companies are getting bigger! The same firms made the top 10 list again. Canfor, West Fraser, Tolko and Resolute were once again the top four lumber producers in Canada, with Interfor moving from seventh to fifth spot due to three of its B.C. Interior mills increasing output. These five companies produced a total of 12.1 billion board feet (51.3 per cent of Canadian lumber output) versus 11.6 billion board feet (51.2 per cent) in 2012. 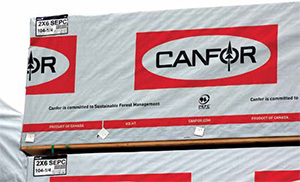 Canfor retained its lead spot by growing its output by nine per cent to 4.21 billion board feet, 17.9 per cent of total Canadian softwood lumber output. Canfor recently sold its only mill in Eastern Canada (Daaquam in Quebec) and is now back to being a B.C./Alberta company in Canada. Coming in second was West Fraser, with 3.57 billion board feet and a 15.2 per cent share of Canadian output. The company continued to operate its B.C. and Alberta sawmills at nearly full capacity, limiting its production growth to three per cent versus 2012. Tolko placed third, but saw its output slip by two per cent to 1.94 billion board feet. In fourth position, Resolute experienced a three per cent gain to reach 1.48 billion board feet, with the gains coming despite its Quebec mills having had to adjust to AAC reductions and the Quebec government’s timber reallocation policy. Interfor was able to raise its output by six per cent, by raising production at its five B.C. mills to 872 million board feet. As Canadian lumber producers are constrained by timber availability in the B.C. Interior and Quebec, it is becoming clearer that the U.S. South is being targeted for further growth by acquisition. And other industry and market dynamics are sure to allow for more changes in the top 10 list in 2014. By tracking the ongoing number of sawmill transactions in the U.S. South, it is clear that the Canadian sawmilling industry seems to have identified that region to have the greatest availability of under-utilized mature timber in North America, not to mention the largest housing market. As Canadian lumber producers are becoming constrained by timber availability in the B.C. Interior and Quebec, it is clear that many are still on the hunt for further acquisitions, with the U.S. South being the destination with more than 25 mills now owned by Canadian firms, with investments there going back to 2000 (starting with West Fraser’s purchase of sawmills in the South). 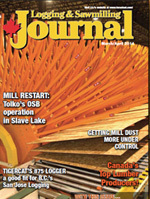 Conversely, within Canada, most companies are limited to conducting upgrades to existing mills to incrementally improve fibre utilization and lumber recovery, but only where the fibre supply can support the long-term future of the sawmill. The lumber production landscape will certainly look different at the end of 2014, as rising lumber prices and increased company revenues will be mainly responsible for a surge of announcements on lumber mill start-ups or extra shifts as well as acquisitions. Favourable lumber prices are expected in 2014 with soaring prices forecast for the 2015-2016 period. This is when the full impact of the long-discussed “lumber super-cycle” is scheduled to occur where North American dimension lumber and stud prices are expected to surge as supply struggles to keep up with demand, assuming that the U.S. housing market and economy return to more normal levels. China should continue to be a factor, as exports to China are forecast to increase steadily to the end of the decade (and beyond) as their fibre supply gap widens. As over the last two years, the entire supply chain continues to be under siege from a variety of short-term shortages, be it timber, loggers, mill workers, trucks, railcars, or access to capital. Looking ahead, markets are expected to get volatile, so fasten your seatbelt before it gets here!